A special formula designed to address symptoms like hot flashes - and like all BergaMet supplements, naturally sourced to support cholesterol and cardiometabolic health. 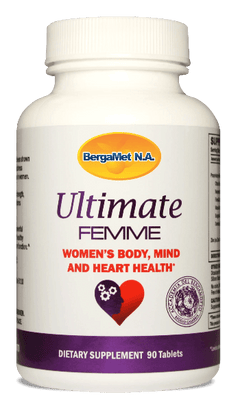 BergaFEMME bergamot superfruit supplement is formulated with BergaMet Mega+O to support cholesterol and cardio-metabolic health, plus with added support for managing symptoms like hot flashes and weight management. Like all BergaMet products, BergaFemme is naturally sourced and contains five unique antioxidant flavonoids that may help support healthy cholesterol, blood glucose levels, and liver function. Bergamot’s health benefits derive from its unique profile of phenolic compounds such as, neoeriocitrin, neohesperidin, naringin, rutin, neodesmin, rhoifolin and poncirin. Naringin has been shown to be beneficial in maintaining normal inflammatory balance, while neoeriocitrin and rutin have been found to exhibit a strong capacity to quench free radicals and maintain healthy LDL cholesterol levels. This formula includes BPF (Bergamot Polyphenolic Fraction), an extract of the bergamot orange(a powerful antioxident that reduces cell damage due to free radicals), shown in a double-blind, placebo-controlled study to help maintain cholesterol, triglyceride, and blood sugar levels within the normal range. BPF reduces cholesterol and supports healthy glucose metabolism. 60 Tablets per bottle. Take one (1) tablet twice a day with main meals. Subscribe for great deals and updates. *These statements have not been evaluated by the Food and Drug Administration. These products are not intended to diagnose, treat, cure or prevent any disease. Results may vary from person to person. Always consult your Doctor if unsure.